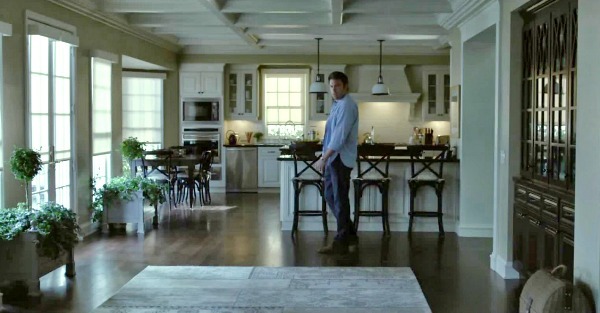 Since the movie Gone Girl came out last year, a lot of you have asked to see photos of Nick and Amy’s house in the suburbs and Desi’s vacation home on the lake. 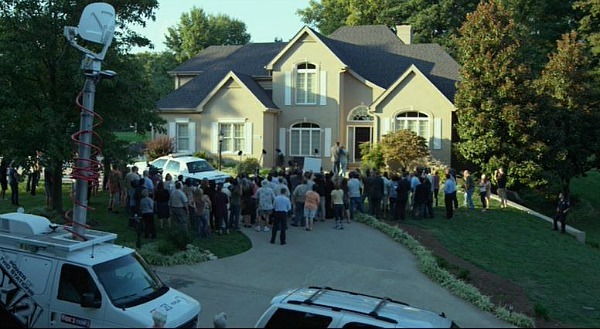 They were both filmed in Cape Girardeau, Missouri, so let’s take a look! It’s a real house and was on the market in 2014. 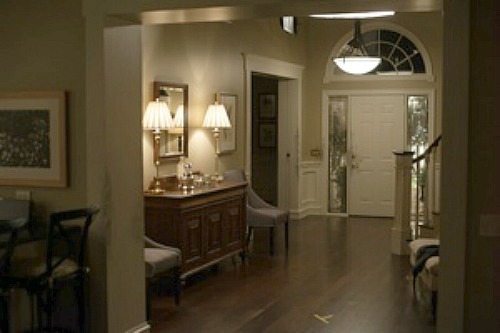 The interiors were created on a separate soundstage (not in the real house). 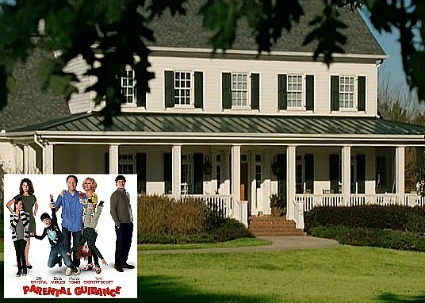 Production Designer Donald Graham Burt gave the transplanted New Yorkers in the movie a nice but impersonal suburban house that looks like it could be a model home. If you look at the rooms you’ll notice very few personal details that would give us clues about the couple that lives here. When Nick comes home to find his wife missing, the detectives who respond to his call remark that even the “crime scene” looks a little too perfect. Man, was Rosamund Pike good in this movie or what? She had me totally freaked out. Ha. In the listing photos you can see the house had new (and improved!) shutters, but fewer of them. I don’t think a house this warm and homey looking would have served the purposes of the film’s story, though. Ha. The town of North Carthage, Missouri, where the story takes place, doesn’t really exist. But the author Gillian Flynn says she had Cape Girardeau in mind when she was writing it, so that’s where they chose to film. The house was built in 1993. It has 5 beds, 6 baths, and 4,400 square feet. It sold for $575,000 in June of 2014 (see the listing with more information here). The other house you guys asked about was the mansion by the lake that belonged to Amy’s ex Desi Collings (Neil Patrick Harris). 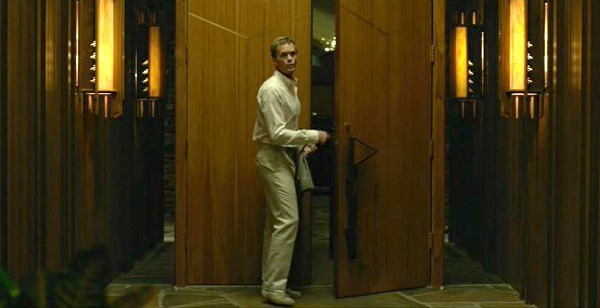 According to Production Designer Donald Graham Burt, the original lake house they planned to use was in L.A. When that fell through, the location manager found this one right outside town in Cape Girardeau. 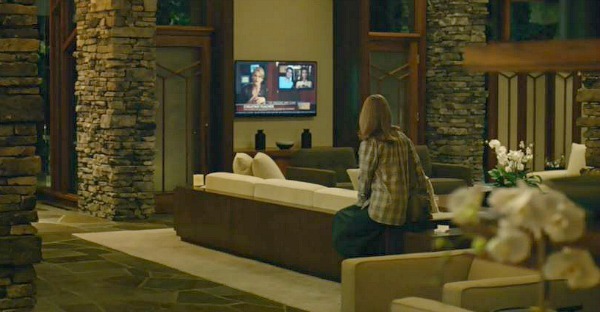 The living room is the only actual location filmed inside the real house. The others were sets. They custom built all the furniture for each room in the movie. Which was your favorite house in the movie? You’ll find more photos and information about the sets and filming locations on Southeast Missourian, Onscreen Style, and Trulia. The Enchanted Cottage from "The One I Love"
Inside the Real House from the Hit TV Show "Empire"
Kudos to them for the improved shutters + fabulous double doors! Did the ending of that movie disappoint anybody besides me? I just didn’t believe for a second that Ben Affleck’s character would go back with that evil woman! It’s funny you should mention that because Dave watched it for the first time last night and felt the same way you did! Nick HAD TO stay with Amy because of his child. Also amy would ruin his life. What I don’t get is what is amy’s actual diagnonis? They call her psycho, is she really? Is the reason bc her parents wrote a book on her life? Her anger at her parents grew into anger with her boyfriends ? rosamund did a good job at sounding cold, her voice was eerie. From what I recall in the book, her mom had a few miscarriages and then had the family celebrate the “birthdays every” year. Also, Amy manipulated situations to make it look like people hurt her or were out to get her, even in grammar school. There is a scene where she Coerces a friend to play a practical joke on her parents, but the friend had no idea Amy had told her parents the same friend was obsessed with her and trying to be her as Amazing Amy. She also resented her parents using her to be “Amazing Amy” and hence felt she had to live up to that whole BS persona and they burned through her money. I would call her a narcissist with sociopathic tendencies, but I could be wrong. Kay – While I was no fan of the novel, the book ends with him going back too, though he tells her he stays with her because he feels sorry for her because she has to wake up as herself every day. She doesn’t like that and there is the ambiguous, will they kill one another or the kid vibe. The lake house is well executed, but not my style at all. 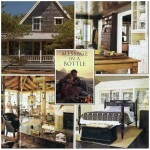 Loved seeing the interiors, it is so much homier than in the film! I love that you put together that driving tour, Stacy! So fun. Next time I’m in Missouri I’m going to have to check it out! Hi Thank you so much for sharing these two homes today! I grew up in Cape Girardeau and remember the architecture of homes most closely resembling the small ranch house at the end of the post! A fellow grade school classmate posted several online sites that featured many of the filming locations in the town, but these were not included, so it was nice to view these additional sites! I have not seen the movie. I must say though, I love the interior of the original (non movie version) home- So bright and colorful! Thank you for sharing! Well, I had planned to see this movie at some point, but now I’m not so sure, after reading the comments on this post. Sounds bizarre! I do like the homes featured though! While the real life 90’s home is more pleasant and homey, I don’t care for the yellow paint, which I used in my home in 1993 as well. To me, the yellow instantly dates the décor. I love the stairway, with the scroll work. 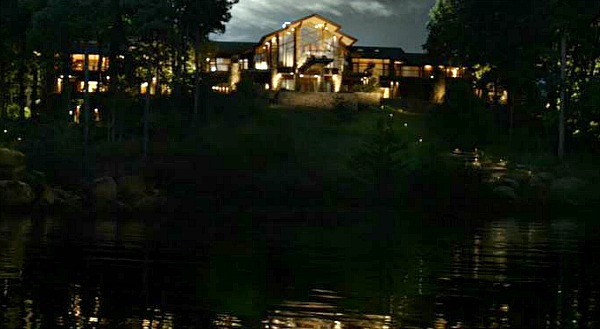 The lakehouse, while a bit modern for my taste, is beautiful. Oddly enough, I just watched this film last night and was curious about the houses chosen for it. I stopped by here this morning and saw this post! 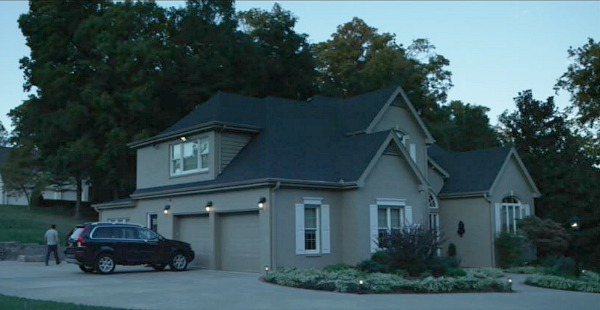 While watching the movie, I immediately noticed how the Dunne home was finished as a very anonymous, suburban “McMansion.” The muted color palette and impersonal decor were perfect for the story. 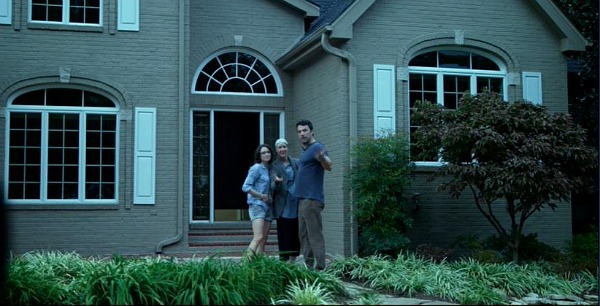 The door was replaced because the movie producer wanted to take the door to the home with them when they left. They probably used it in set reproduction in LA. That is why the home has a new double door look. I’d say it’s an improvement. -also a Cape Girardeau resident ??? ?